The 2016 Diwali is expected to witness a lot of fireworks at the box office with two major releases - Ajay Devgn's Shivaay and Karan Johar's Ae Dil Hai Mushkil. As per the buzz, both the films will give an "unexpected" response in terms of collection around the auspicious occasion, say trade pundits. Set to release on Friday ahead of Diwali on October 30, both the films have been hyped well. 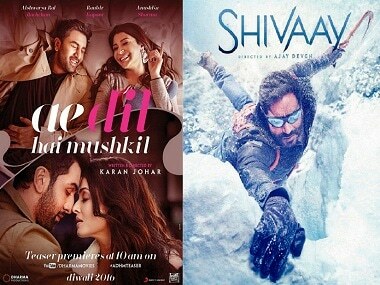 While Ae Dil Hai Mushkil, starring Ranbir Kapoor, Aishwarya Rai Bachchan and Anushka Sharma, created headlines for featuring Pakistani actor Fawad Khan, Shivaay has been appreciated by many for showcasing scenic locales of Bulgaria, Mussoorie and Hyderabad. Ae Dil Hai Mushkil, Shivaay released today, on 28 October. "Both the films have been hyped well. We are expecting an unexpected response from them, but this can only happen if audience will understand the money spent behind making these films and not watch the pirated versions over moblie phones," Delhi-based distributor Joginder Mahajan told IANS. The advance booking for both the films has been "phenomenal," says Devang Sampat, Director, India Strategic Initiatives, Cinepolis India. "Looking at the number of bookings that we have already received this week, I would say that people are eagerly waiting to catch both the movies at the box office," Devang told IANS. "It looks like both the movies should fall into the Rs 100 crore-club though, eventually the content and audience choice will decide the fate. The movies are star powered and are expected to do well," he added. Similar is the response of advance bookings at INOX, said Rajender Singh, Vice President, Programming and Distribution. "We are getting very good response for both the films in advance bookings. We are showing both the films across our INOX cinemas. It's an extended Diwali weekend and we are hopeful that both the films will do very good business," Mr. Singh told IANS. Not only at cinemas, the advance-booking of both the films are doing well over various online ticket booking platforms as well. "With Ae Dil Hai Mushkil we are expecting huge spike in our bookings, the collections will be aided by the extended Diwali weekend. 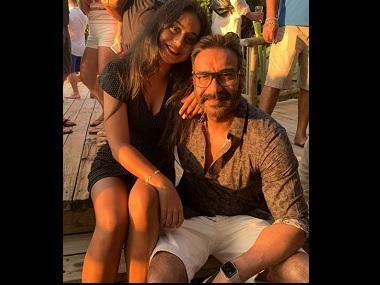 The star studded cast of the movie along with its young theme of love, friendship and heartbreak is going to be a treat for the audience," Renu Satti, Vice President, Paytm, said. Harsh Rohatgi, CEO, JustTickets Pvt Ltd said: "Ae Dil Hai Mushkil has definitely emerged as the Diwali film to look forward to this festive season. We expect a lot of traffic as advances open on Justickets."